A raised paddle held in the ten o'clock position indicated that the paddler had sighted a seal on the ice. A man who raised his paddle and waved it back and forth was calling for help. When the route ahead was blocked or dangerous, a man would raise his paddle and let it fall toward the direction where it was safe to travel. Frank explained: "If he sees that, even though he's far away, he would turn before he got to the dangerous spot." Noah Andrew (pictured above) noted that at the mouth of the Kuskokwim, hunters today use these same signals. Gaff referred to by Frank Andrew as a "life hook." 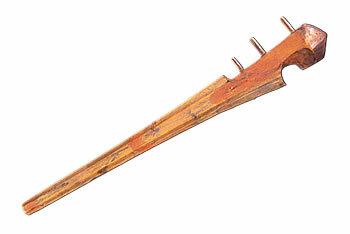 John Phillip said, "Down on the ocean, the negcik was our most important tool." The gaff was used to test the strength and thickness of ice, to keep a hunter from falling through cracks, to steady the kayak when entering and exiting, and to pull a man to safety in an emergency. Alex Bird said, "When they hunted geese, they pushed their catches inside their kayaks. When they unloaded, they used the small gaff to get their catches out. 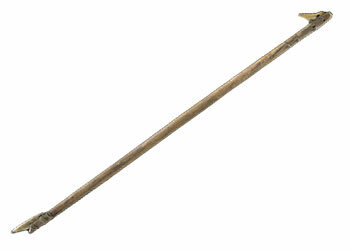 Spear thrower used by both men and women. 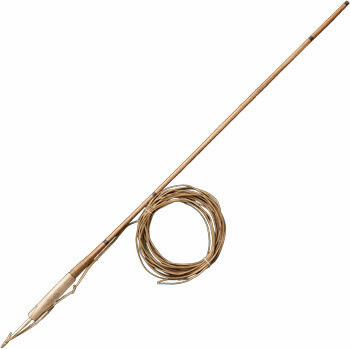 Annie Blue said, "This device made the spear go farther, and it will make the throw more powerful." Paul John demonstrates the use of a spear thrower. Frank Andrew recalled: "At high tide, they let us practice throwing seal-hunting spears using a spear thrower. We aimed at little things, pretending that the foam was a floating seal." 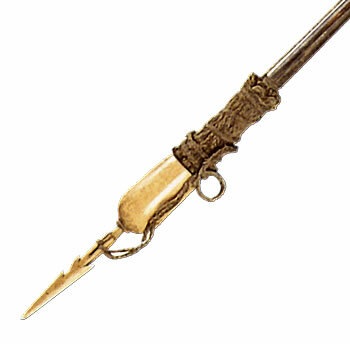 Barbed harpoon with seal bladder float. 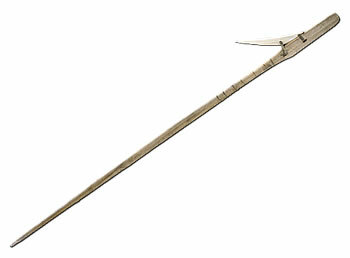 Peter John called the barbed point the "harpoon's hand" that held onto the animal that was pierced. 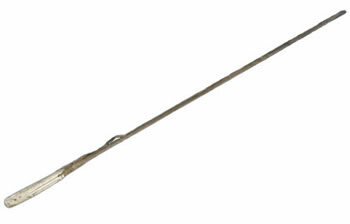 The heavy socket piece, made to hold a barbed point, weights the front and allows the spear to float upright in water for easy retrieval. 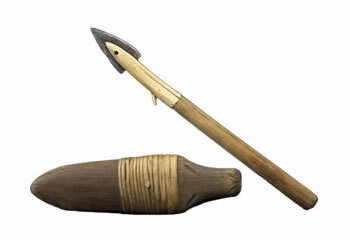 Dennis Sheldon noted: "The harpoon point gets left behind in the animal and turns sideways. When the hole where the point entered is small, and when it suddenly turns sideways, it cannot come off." 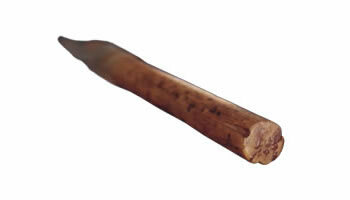 Frank Andrew said: "To hunt walrus, you would insert the point into the shaft. When it hits the walrus, because it is heavy and has a strong impact, it forces the point deep inside. The shaft would then fly back." Paul John demonstrates one use of the Nunivak lance at the Ethnologisches Museum Berlin, 1997. Frank Andrew noted: "This is the covering, bound together with spruce roots. 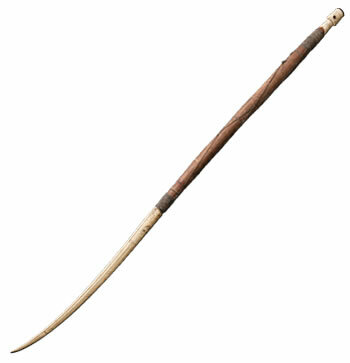 This also has a small point at the spearhead's edge, that would pierce when it hits." Frank Andrew explained the incisions on the point's base: "Some have these small spaces that provide an air pocket in the insertion hole, where the point is attached. These spaces aren't decorations but are filled with [compressed] air that can help the shaft come off easily and fly back."